The Coupe is the first of three new Mini variants that will go on sale by the end of next year. BERLIN -- Boris Knoblich is one of the reasons why BMW AG is struggling to create a bigger market for its Mini cars. The 37-year-old media consultant from Berlin doesn't have the carmaker's urban car brand on his shopping list, rejecting the new two-seater Mini coupe that his dealer offered as a replacement to his BMW 1-series compact. "It's a bit racy-looking compared with other Minis, but too small and not variable enough," said Knoblich, who's considering another 1 series as well as an Audi A3 and Auris hybrid from Toyota Motor Corp. "I need a multifunctional car." Mini, which was salvaged from the wreckage of the failed takeover of the UK's Rover Group, is central to BMW's strategy to meet tighter environmental standards and fend off Volkswagen AG's Audi and Daimler AG's Mercedes-Benz. The world's biggest premium carmaker plans to tighten cooperation between Mini and the namesake brand by sharing front-wheel drive technology after the Mini hatchback is overhauled in 2014. The coupe, which went on sale in Europe on Oct. 1 at a starting price of 21,200 euros and will hit U.S. dealers later this fall, is the first of three new Mini variants that will go on sale by the end of next year, expanding the lineup to seven similarly sized vehicles. The new models, which all share the same basic underpinnings, will probably do little beyond keeping the brand's sales from declining as the iconic Mini hatchback ages, analysts said. "Mini can't do the volumes that they want with the body styles that they have," said Rebecca Lindland, an analyst IHS Automotive in Norwalk, Connecticut. "They have to push the envelope up and down" with larger and smaller models. Growth in Mini's deliveries will probably slow to 2.7 percent in 2012 and 1.6 percent in 2013 after jumping 23 percent this year on demand for the four-door Countryman crossover, according to IHS Automotive forecasts. The helmet-topped coupe will be joined by a roadster and the Paceman, a sportier crossover, by the end of 2012. The roadster and coupe are set to vie for the status as the brand's worst seller, with coupe sales pegged at 6.2 percent of 2013 deliveries of 296,240 cars and the roadster at 5 percent, according to IHS. Audi targeted Mini with the A1 subcompact. Daimler is adding to that pressure as it rolls out five new Mercedes compact cars starting with the revamped B class this quarter. The automaker's Smart city car will expand beyond a two-seater from 2013, after confronting its own size limits. Mini isn't concerned by the potential slow sales for the derivatives and plans further expansion to the lineup and markets, said Kay Segler, the brand's chief. "I see great potential for Mini," said Segler in an e-mail response to questions. "There's no limit to our creativity. We can imagine additional models with typical Mini characteristics -- up to 10 models are conceivable." Mini, based in Oxford, England, plans to enter India next year after expanding to Indonesia in 2011, he said. BMW is targeting record Mini sales this year, with deliveries set to rise at least 10 percent. The coupe will be Mini's first two-seater. The loss of the rear bench leads to a drop in weight of 60 kilograms (132 pounds), helping it accelerate to 100 kilometers (62 miles) per hour in 9 seconds, one tenth of a second faster than the corresponding hatchback. The engines are shared with other Mini models. While it's 2.9 centimeters (1.1 inches) shorter than the hatchback, the length and width are nearly identical, reflecting the size constraints faced by the brand's models. "The coupe is quirky, but that's what Mini is," said Garel Rhys, president of the auto industry research center at the UK's Cardiff University. "BMW is showing that they're pretty clever and innovative with the derivatives." The close association of the coupe with the brand's other models should boost profit margins, especially considering its price is 1,650 euros, or 8.4 percent, more than the similarly equipped hatchback, said Jonathon Poskitt, an analyst at J.D. Power and Associates in Oxford, England. The coupe relies on "synergies" with other models and every variant has to "stand on its own," Mini's Segler said. The new two-seater will likely appeal to men under 35 looking for a conspicuous car, said Werner Entenmann, head of Autohaus Entenmann in Esslingen near Stuttgart. He celebrated the introduction of the model with a party for 800 guests, including a champagne reception and cocktails. "We expect it to be a niche, lifestyle-oriented car," said Entenmann, who plans to reserve one or two places for the coupe in his Mini showroom, which can display up to eight vehicles. "It either fascinates or leaves people cold. There's no middle ground." 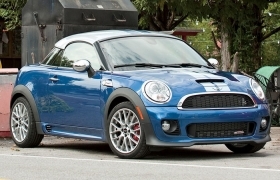 The coupe is part of Mini's development toward more independence, said the dealer, who sells Mini and BMW cars. He is hoping for a larger model from the brand. So is Knoblich. "Mini works as a city car," said the 1 series driver. "But I need something that's a city car, can drive long distances and transport stuff and people. Mini doesn't offer that right now."